Several 2 or 3 day paddles are also possible. Some groups start at either Lake Bonney (near Nappers Bridge) or Bruno Bay (at Cobdogla) for a 3 day one-way or return trip. This can include sections of the Murray River, visiting Kingston-on-Murray (has a general store) and paddling a return trip through Lock 3 – just for the fun of it! It is important to check the weather forecast before embarking on an extended trip.In the summer, day time temperatures can be over 40˚C and so adequate precautions need to be taken, such as staying in the shade and minimising physical exertion during the heat of the day, drinking adequate quantities of water and wearing appropriate sun protection. During the warmer months mosquitos can be a problem. Mosquitos on occasions carry the diseases Ross River Fever and Murray Valley Encephalitis. To avoid being bitten by mosquitos (a particular problem on dusk), clothing which covers all exposed skin plus an insect repellent is recommended. The insect repellent is handy to repell flies which can be a problem during the day. A tent with a good quality inner which is insect proof is recommended. During winter, on cold, rainy days with the effects of wind chill, hypothermia is an issue and appropriate waterproof and warm clothing, shelter, stoves and food and water are necessary equipment in case of an emergency. Nights can be below 0˚C during winter and so a good quality sleeping bag and a tent are essential for overnight expeditions. After heavy rain the clay soils of the Riverland Parks floodplain become very boggy and when necessary the Rangers close access roads to prevent damage to the environment. Even when the roads are open, vehicle users are strongly encouraged to avoid wet patches so as not to become bogged and damage the environment. Other hazardous driving conditions include corrugated track surfaces and narrow winding roads. The scenery of Loch Luna is world class. The fire danger season for all Riverland Parks begins on November 1st and ends on April 12th (this differs to the fire restriction dates set by the CFS). During this period only gas fires are allowed. There are no fires permitted on days of total fire ban. At other times campers are encouraged to practice minimum impact procedures by using a gas stove which is faster and cleaner for cooking. This will minimise the impact on the environment as trees and dead wood are homes for native animals. Otherwise, dig a shallow pit (30cm) for the fire, in a cleared area, 3 metres away from vegetation, trees and tree roots. In leaf litter, spiders, scorpions and other invertebrates are likely to be encountered which, with common sense, can generaly be avoided. If someone in the group has an allergic reaction to invertabrate bites, there are creams available from pharmacies which reduce the pain, inflamation and itching from stings which if included in your first aid kit, is generally all that is required if you are unlucky enough to be bitten. 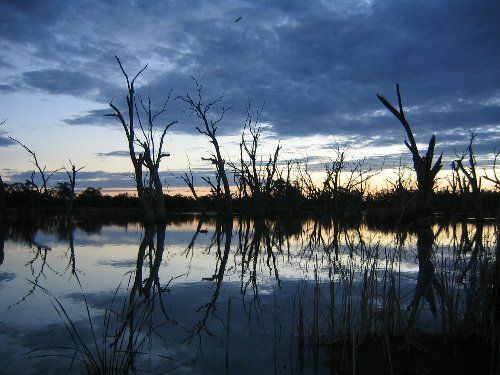 When camping at Loch Luna, as River Red Gums are prone to dropping limbs without warning, it is highly recommended that people avoid camping under them. The level of the water throughout the system can vary. Thus one must be aware that banks may be slippery, submerged logs may not be apparent, and the depth of water may vary greatly. It is advisable to wear protective footwear when paddling. 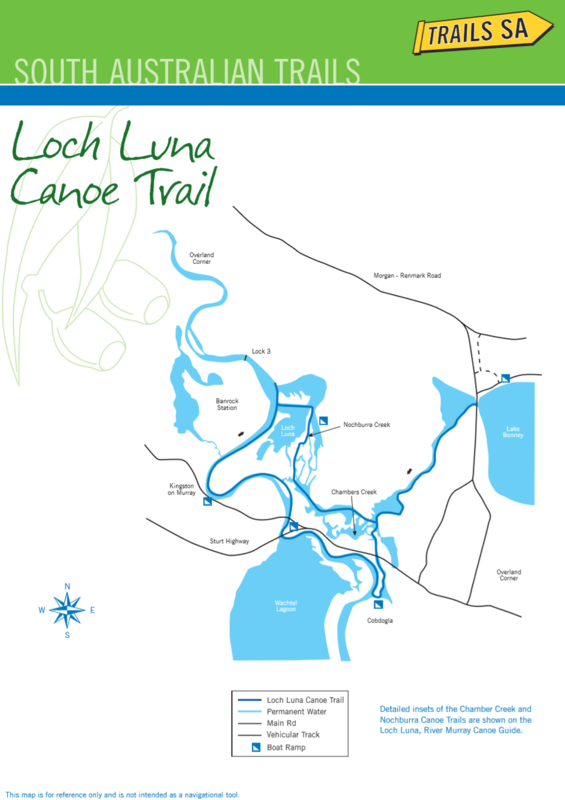 It is highly recommended that at all times when paddling in the Loch Luna region, protective footwear such as sneakers or wetsuit shoes are worn for protection from sharp sticks and stones, broken glass and bites. Sun glasses are recommended as protection from sunglare and head high vegetation. current as paddlers can be pushed into fallen trees or other obstacles across the creek resulting in a capsize and a struggle to get to safety. In the main channel of Chambers Creek and the River Murray one might encounter power boats and tourist boats. If this occurs all craft must keep to the right of the waterway to allow them to pass on your left. This is particularly important on blind corners as power boats might be approaching at high speed. On encountering speed boats it is worth noting that the river may become quite choppy, making paddling difficult for inexperienced participants. In strong winds, open areas of water can also become quite choppy. If paddling on Lake Bonney or Wachtels Lagoon in windy weather a steep chop may develop which is quite hazardous for inexperienced paddlers.